Carte Des Nouvelles Decouvertes dresseee par Phil. Buache… [with] Extrait d'une Carte Japonoise de l'Univers apportee en Europe par Kaempfer . . . [Bay of the West] - DIDEROT, D.
Title : Carte Des Nouvelles Decouvertes dresseee par Phil. Buache… [with] Extrait d'une Carte Japonoise de l'Univers apportee en Europe par Kaempfer . . . [Bay of the West] . Size : 11.9 x 15.3 inches. / 30.1 x 38.9 cm. Description :This map is most notable for it's depiction of "Mer de L'Ouest" or "Sea of the West", a great sea, easily the size of the Mediterranean, to flow from the then-known Strait of Juan de Fuca. 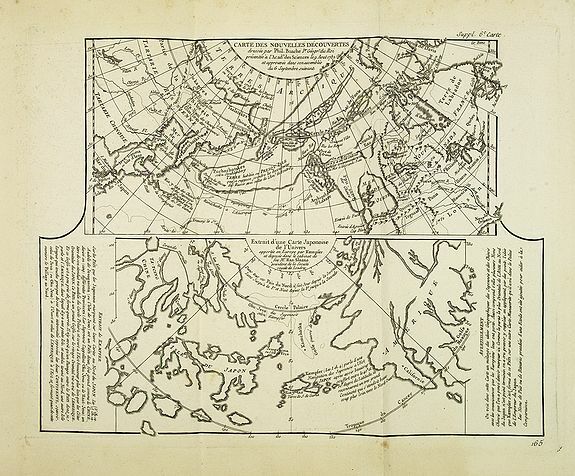 The map is from Diderot's "Encyclopaedia" which contains ten maps of Asia, America and the Arctic Regions. In both maps there are texts a.o. by Kaempfer who refers to voyages made by Japanese seafarers in that region. Mcguirk, Mer de l'Ouest, 146, version 2. Condition : In very good condition. Wide margins. Slight discolouration along center fold.